In Jan Gordon's "GRADUS AD ... MONTPARNASSUM" (Blackwood's, March 1929, under his "Salis" pseudonym), he writes, "In retrospect it is not the final success but precisely the early years of struggle, the lower slopes of Parnassus, which recur to the memory with a pleasing flavour." He describes their first four shows, one in Buxton, England, one in Ghent, Belgium and two in Paris. Jan and Cora Gordon exhibited their paintings and etchings publicly from 1909 onwards. Their initial small post-marriage Buxton show was followed by an exhibition in Ghent, which was shared with a German friend. A motif from one painting dating from the time of that Ghent exhibition was later discussed at length in "A Step-ladder to Painting" (1934). According to the story, the opening of the first of the Paris shows, at the studio of Henri Manuel, coincided with the fall of the Ministry (perhaps January 2012 since the next government overthrow was in December 1913), but "the show was .. noticed favourably - one of a thousand others per annum - by several of the big Parisian dailies". Their fourth show, driven by "sheer poverty", was "under the aegis of a well-to-do American friend". An amusing encounter between Cora Gordon and the famous Eduard de Max (who had been unable to attend) took place after the show. London, Sept. 7, 1910. "Among the works sold at the third Salon of the Allied Artists' Association were ... etchings by Cora J. Gordon." Paris, Nov. 9, 1910. At the 1910 seventh annual Salon de la Gravure Originale en couleurs, Galeries Petit, it was reported that "Jan and Mrs. Cora Gordon show several very interesting decorative designs." London, Aug. 8th, 1911. Cora J. Gordon is mentioned in the company of younger artists showing "admirable work" and "rapidly building up reputations through the opportunity" given by the 4th London Salon at the Royal Albert Hall. 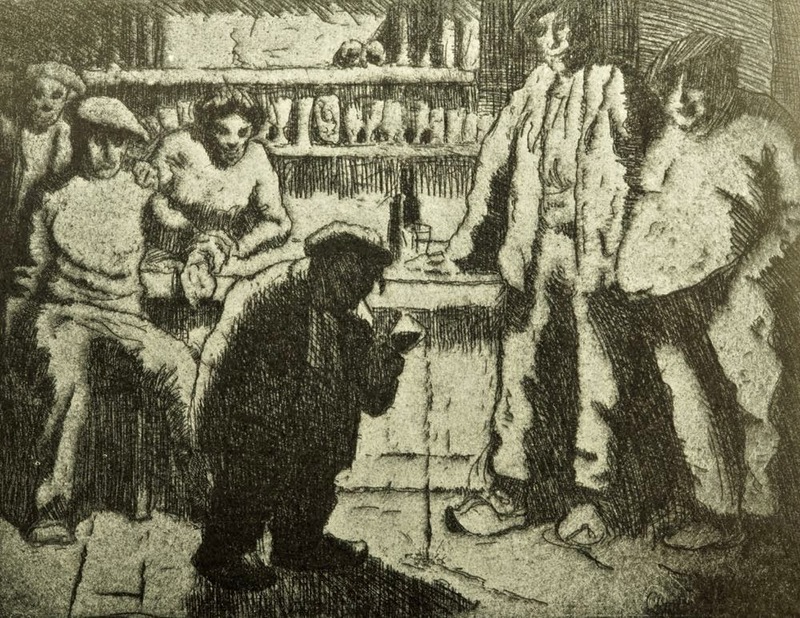 In 1912, Jan Gordon had the following etching exhibited at the Société Nationale des Beaux-Arts, Paris. It is reproduced in "The Studio" with a brief comment, by E.A. Taylor, "Amongst the works by British and American artists in this Salon the most able and sincere were shown by Mr. Jan Gordon, ..."
The Tipsy Dwarf, 1912. Exhibited Société Nationale des Beaux-Arts, Paris. Apparently this picture was on the wall in the Leeds house, but at some point it must have "walked." Jan Gordon describes how those "first adventurous, exciting steps at the foot of Montparnassus" were put behind them with the "opening of the regular dealer's door" (such as the XXI Gallery in London), when "exhibiting becomes a mere monotonous interlude in the artist's career".